This month Naomi is doing Cinco de Mayo drinks that are not margaritas…Olay! Tinis aren’t just for vodka! I found this Garnish with Lemon through Pinterest (of course). It was a must try for the tequila girl. 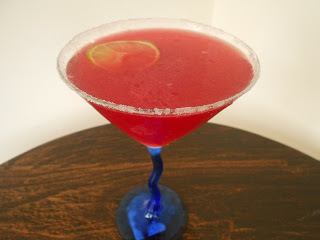 Now, prepared another way, it would be a Pomegranate margarita, but this was a fun way to try it. Important on this one, make sure all glassware and shakers are well chilled as this isn’t served with ice and it lost its appeal when it warmed up. Also, if desired, rim glassware with sugar. It really made it pop. 1) If desired, prepare the glass by rubbing edge with lime wedge and the coat in sugar. Return glass to freezer. Pour all ingredients in a martini shaker filled with ice and shake well. Strain contents of shaker into glass and serve immediately.